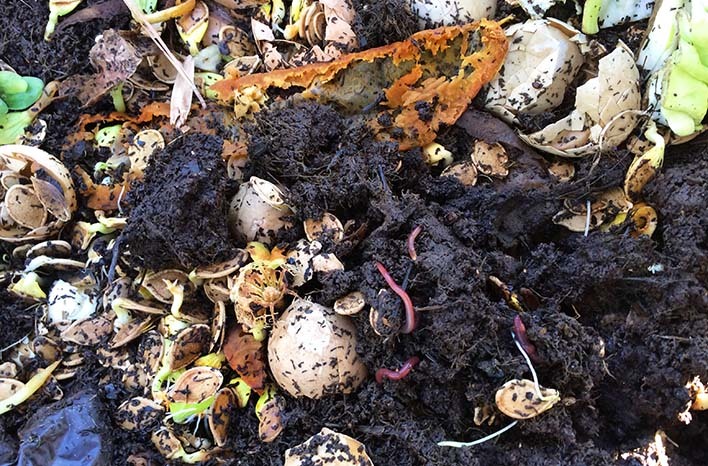 Composting at home leads to many questions from eager gardeners regarding techniques and best practices. 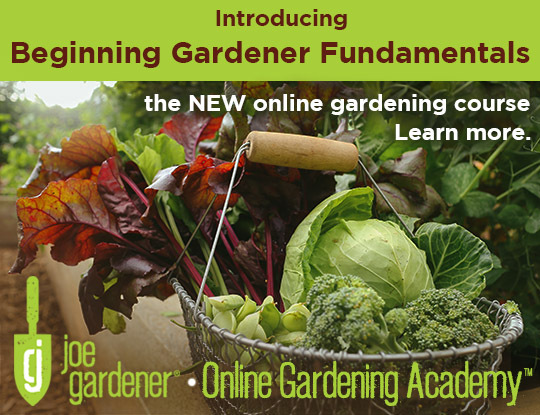 Well this week, I wanted to answer some of those very specific – and common – questions posed by members of the joe gardener community. If you’ve been a follower of The joe gardener Show podcast for long, you’ve heard me mention my joegardener Facebook group. 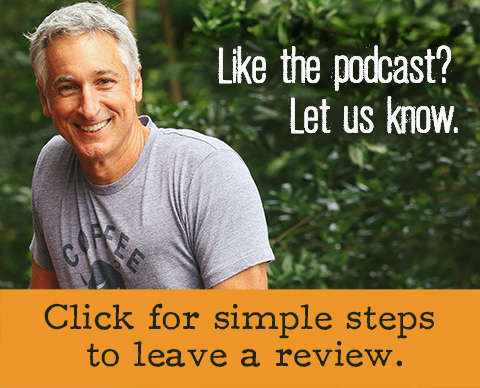 This active and supportive band of weekend warriors and garden professionals are engaged every day in sharing their questions and experiences. I asked the group what compost questions they would most like me to address. 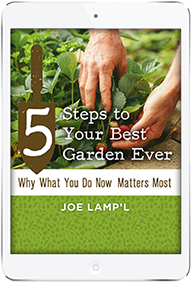 As is always the case, I received a tremendous response on specific items that I think will resonate with all gardeners. Let’s dive in. How often and when should I add compost to my garden? Compost is the best amendment you can use to improve the health of your soil. It’s great to add any time of the year. The only drawback to composting at home is that there never seems to be enough! For that reason, I add it when I know it will do the most good – during the active growing season. 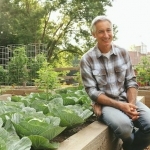 I topdress my garden beds twice a year – once in early spring as I prepare to plant my summer crops and, again, in early fall as I prepare to plant my fall crops. Microbes in the soil (more on that coming up) are most active during the warmer months of the growing season, and they will incorporate compost nutrients more quickly during that time. Those nutrients feed my soil, so it’s replenished to feed my plants. Compost is one of the best things you can add for rich, loamy soil like this. 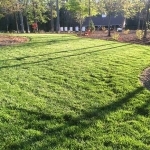 I topdress my landscape beds once, in the spring, to provide a nutrient jump start to budding plants, trees and shrubs. I add approximately one inch of compost to the surface of the soil. Because I’ve been amending my landscape and garden soil for years, I know it’s already very healthy with lots of microbial activity. Disturbing the soil can disrupt that biological network under the surface, so I let the microbes do the work of incorporating the compost down into the soil for me. If you are preparing a new garden bed, I recommend turning the compost into the soil to blend everything together and get that biological activity going. 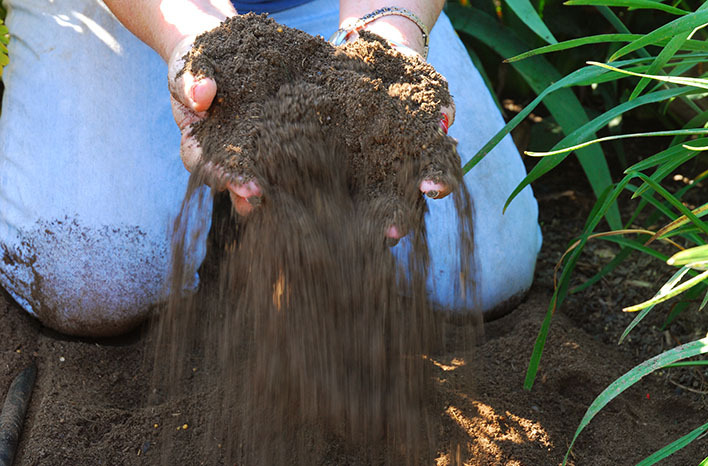 For subsequent applications, you should just lightly scratch compost into the first half to one inch of soil. It’s that topmost layer where the plant feeder roots need the nutrients most, so there’s no need to disrupt the soil further down. As your soil becomes richer and loamier over time, you won’t have a need to scratch it in and can simply lay the compost on the surface as I do. This is just one of the reasons that gardening organically really does make your job easier over time. Chemical treatments can kill microbes in the soil – so healthy, organic soil will be thriving with the biological life which does much of your work for you. I topdress my lawn with about an inch of compost each fall too. 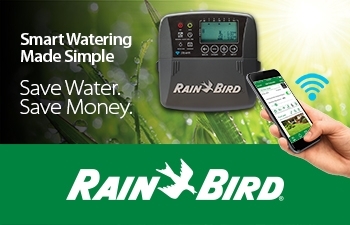 That sets it up to be more robust during the most active growing season of my cool-season fescue, and it makes my lawn more drought and heat tolerant heading into the following spring and summer. As I water my lawn or as it rains, the compost quickly makes its way down to the soil surface and the microbes do the rest. It doesn’t get much easier than that. When buying compost, what should I ask for and where can I purchase it? I make a lot of compost, but at my five acre GardenFarm™, I always need more. Not all compost is created equal, so when in doubt, look for certified compost. Certification indicates that the compost has met the standards of the US Composting Council (USCC). The USCC tests for a stringent set of criteria on quality, nutrient balance, chemical properties, etc. ; so you can feel confident that it is a safe and nutrient-rich amendment. If you aren’t able to find certified compost, the USCC website has some resources which can point you in the right direction. I collect kitchen scraps in a bowl throughout the week. This bowl has a cover, to contain any odors before I’m able to take these contents out to the compost bins. If you need more than a cubic yard of compost (check online for tools available to help you calculate the amount of compost you need), consider buying bulk compost. Buying in bulk is less expensive, and since it doesn’t involve the plastic bags, it’s a little more environmentally friendly too. Many providers of bulk compost will deliver, so be sure to ask. When you buy in bulk, be sure to ask plenty of questions of your supplier. 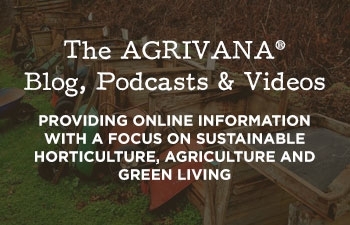 I’ve included some suggestions along with other compost-buying tips in my Raised Bed Gardening podcast series of last spring. So, be sure to check that out. When in doubt, I recommend testing a small area of your garden with an application of the compost. With all bulk compost there is a risk it was made with hay or manure which contains persistent herbicide. I made the mistake of applying horse manure at the GardenFarm, which I soon realized did contain persistent herbicide. The herbicide survives the composting process and will kill (or at best, stunt) your plants. It can take years to recover from one bad application. So, play it safe. Should I add water to my compost pile or leave it dry? 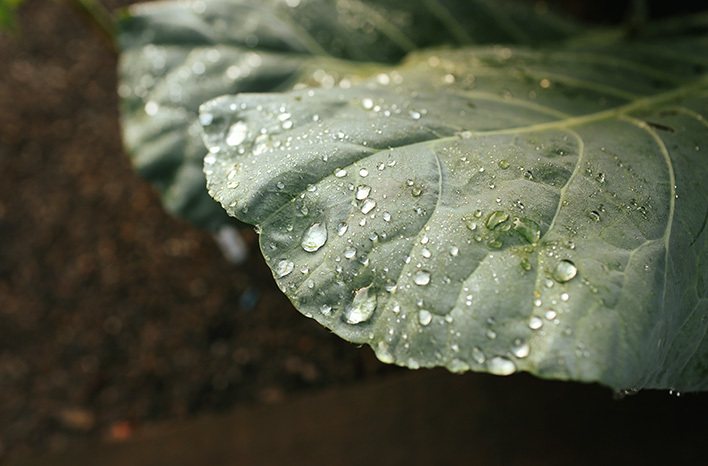 Moisture is one of the key ingredients for creating compost quickly. Dry materials will break down into compost, but the process will take much longer. Why? It’s the microbial activity within the compost pile which works to break down all those materials. Like all life, those organisms require water, food and air for survival. If you provide those elements, the organisms thrive and can make quick work of your inputs. I spray my compost pile once each week. When I turn the heap, I’m exposing the inner contents. It’s at this point I spray everything down until it’s the consistency of a damp sponge. Then, I continue turning the pile to get good distribution of moisture and materials all through the heap. It takes about five minutes to get everything incorporated and gathered back together. It is possible to add too much water. If the pile is too damp it will begin to emit a sour odor, so try not to overdo the watering. During periods of ongoing heavy rain, it’s a good idea to cover the pile to prevent it from staying too wet for too long. Just be sure to continue to turn the heap to keep the air flowing. 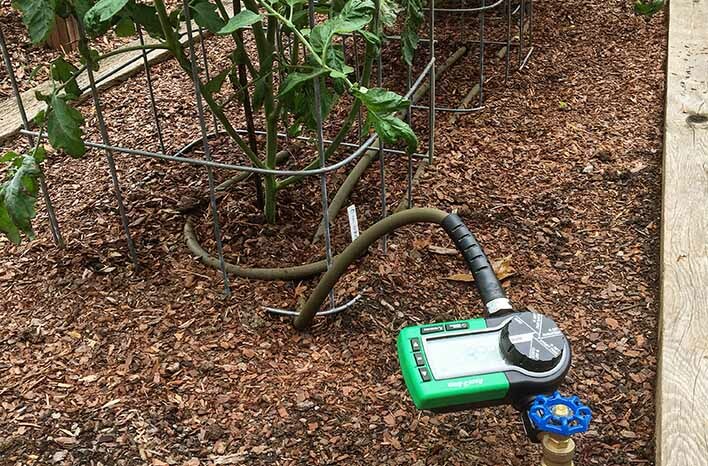 Proper moisture is a key component of active compost. Add water to your pile or bin once each week to keep the material the consistency of a damp sponge. 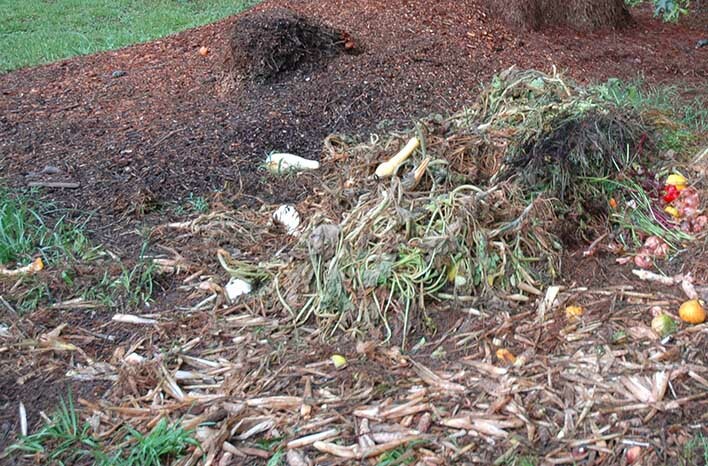 There are two causes of a foul odor coming from your compost pile. The first is that it’s been too wet for too long. The second is an imbalance of materials. Compost should be a mix of green and brown materials. Now if you’ve never composted before, don’t take those colors literally. They are simply the common terms for the two types of materials which can be composted. Green materials provide nitrogen. Examples of green materials include kitchen scraps (fruits and vegetables) and grass clippings. Brown materials provide carbon. Paper and leaves are good examples of brown material. When it comes to making compost there is so much information out there about the ratio of brown vs. green material you should add. If those ratios have ever caused you concern, rest easy. It just doesn’t need to be that complicated. I’ve been composting for years, and I never pay such strict attention to ratios. All any of us really need to do is strive for an even balance. If your compost heap is about half green and half brown materials, that’s okay. If you want to dial in the suggested ratios more precisely, shoot for three-parts brown to one-part green. I add whatever I have available to me. If I have a little more carbon material than nitrogen material – or vice versa – my compost might take a few more weeks to finish, but I’m okay with that. I would rather work with what I’ve got than geek out over ratios. That said – if your compost has begun to smell, that’s your first indication that your balance is a little out of whack with too much nitrogen (too much green material). That’s an easy fix. Mix in more carbon (brown) material – leaves, paper, cardboard. Brown materials tend to be dry, so they offset that other problem – compost which is too wet. 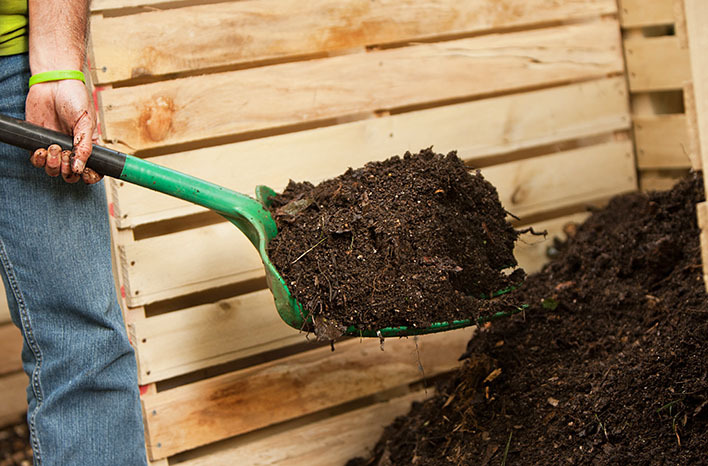 Turn and moisten your compost pile weekly to help materials break down quickly. If you do choose to add paper, don’t worry about the ink. Although inks used to be a concern because they contained metal, all modern inks are vegetable-based and safe in compost. Do avoid using those glossy circulars or waxy papers, as they will take longer to break down and are better sent to recycling. How do I achieve the right temperature? The heat of compost isn’t generated by the sun. It’s generated by the activity of the microorganisms working in the pile to break down (consume) the materials. When those materials – along with proper air and moisture – are at good levels, the microorganisms reproduce and the decomposition process speeds up, generating more heat. I compiled a list of compostable materials – and whether they are considered green or brown – in my Complete Guide to Home Composting. 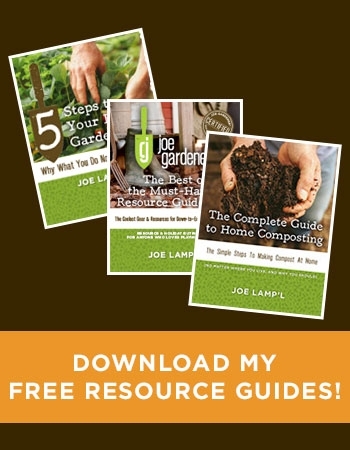 This guide lives up to its name and really is a comprehensive resource for all things related to compost – including the materials list at the back. It’s free, and I hope you find it helpful for your home composting. The fact is, the “right” temperature is somewhat relative and depends on your individual needs. Materials in a cool compost heap will break down. Decomposition will just happen slowly, over the course of a year or longer. The hotter your compost, the more quickly it will finish and be ready to add to your garden. Although weather does play a role (as I’ll explain in a moment), the temperature of your compost will rise and fall according to your levels of green and brown materials, the moisture you provide, and how often you turn the pile to mix oxygen throughout the contents. A compost thermometer is a small investment to get great feedback on the state of your active composting efforts. 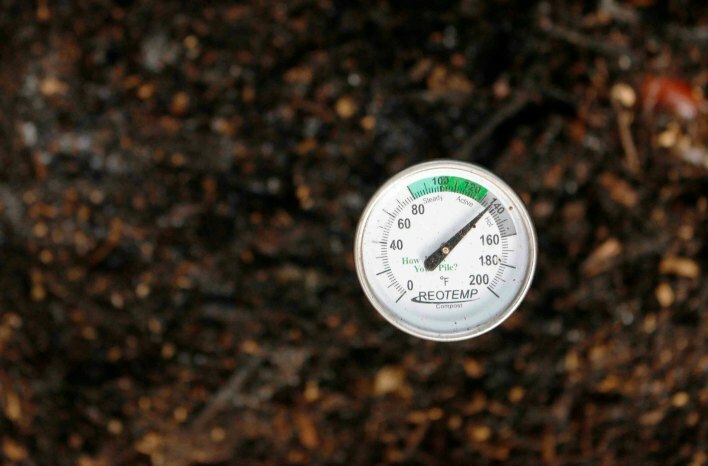 If your pile is at or above 140 degrees, you’re well on your way to quick compost. 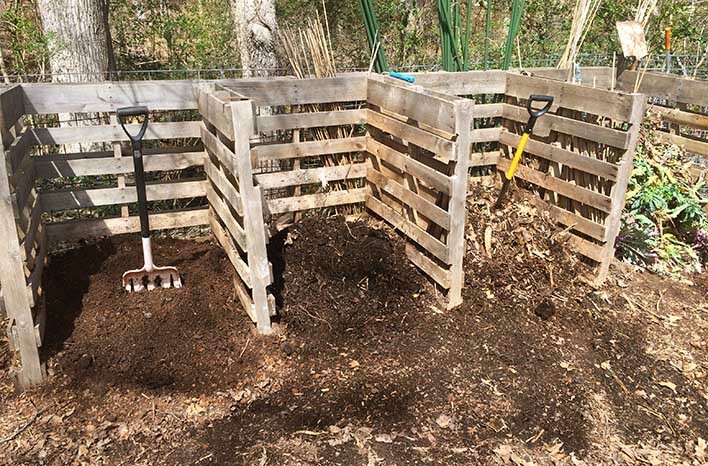 Why isn’t the compost pile getting hot – in spite of having a good balance of ingredients? When a compost heap is generating good heat, you can actually see it steaming. I always get excited when I steam rising from my compost pile, because I like to have finished compost for the garden as quickly as possible. Although that steam is a good indicator, it doesn’t dial you in to what’s really going on. A compost thermometer is an inexpensive tool to take the guesswork out of composting. It has a probe that is 18-24” long, so it can get down into the center of the pile and help you monitor temperature changes. When composting at home, aim to keep my compost at a temperature of 140-150 degrees F. That temperature promotes quick compost, and it is hot enough to kill off most pathogens which might have been present in any of the compost inputs. If I see the temperature reading dip down, I know I need to go back to the basics. Do I have a fairly even balance of green to brown materials? Have I been turning the pile once a week to provide the oxygen necessary for decomposition? Is it moist enough or too moist? There is one more aspect to creating good heat in your compost heap, and that is size. The optimal size for a compost pile is approximately 4’ deep by 4’ wide. A larger pile is just too difficult for the home gardener to maintain. More importantly – if your pile is smaller, it won’t have the capacity to reach those higher temperatures. Think about the materials you’ve added and whether you need to rebalance with more green or more brown material. Make sure to turn the pile once a week. Add moisture to keep the consistency similar to a damp sponge. Keep adding those inputs until your pile is 4’x4’x4’. Because I maintain a temperature of around 140 degrees F, these raw materials will break down into finished compost within two to three months. If I want finished compost in 3-6 months, do I need to turn it and add water more than once a month? Yes. To achieve finished compost in under six months, it needs your attention every week. You can get by with missing a week here or there – if you go on vacation, for instance. Without a regular infusion of water and air, the microbial activity which breaks down the raw materials will slow down significantly. So, you’ll need to turn the pile and add moisture every week – or wait several months longer for the finished product. 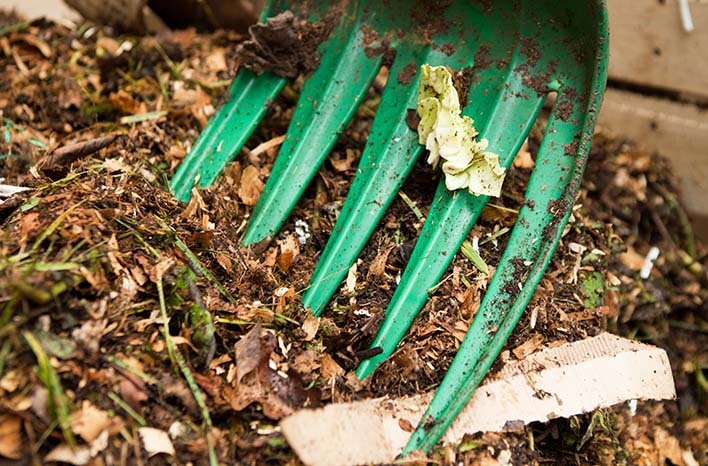 Another tip for quicker compost: Cut or tear compost material into smaller pieces. Shredded leaves decompose more quickly than whole leaves. Small chunks of fruit rind break down more quickly than larger pieces. You get the picture. Reduce the size, and reduce your wait. When should I start turning my new compost pile? Start working that pile right away. Even if you’ve only just begun to add materials – mix them up a bit. It will only take a moment, and it will help to promote decomposition even at this early stage. As the heap grows with new inputs, continue to maintain it with those weekly turnings and waterings. Stop adding materials once the pile has reached about 4’x4’x4’ – and begin a new pile. Then, keep up with the weekly turning and moisture in both piles. It won’t be long before that first pile is ready to add to your garden. There’s nothing wrong with tossing whole materials into the compost bin. But cutting or tearing them into smaller pieces will speed up the composting process. Does compost need to cool before it can be used? When your compost is still hot – or warm – it’s not done. The heat is an indication that the decomposition process is still, well, in process. Your compost is ready to use once it has cooled to ambient temperature – in other words, the temperature of the air around it. At that point, all of the ingredients should look relatively uniform in size. The compost should have a crumbly texture and an earthy smell. Can weeds be added to compost? Once you’ve pulled those weeds, you might as well make use of them. They are a green material – their foliage and roots are a source of nitrogen. If those weeds have gone to seed, there are a few concerns to be aware of. Weeds set seeds after they have flowered, but most seeds will die within a few hours of being exposed to temperatures of 140 degrees F or higher. Even if your compost maintains at 108 degrees F or more, those weed seeds will still die – just not for several days. Since they will remain in your compost to decompose for at least that long, chances are that the seeds will no longer be viable by the time your compost is ready to use. That 140 degree F mark is my magic number when it comes to compost. It’s what I strive for at all times, because I know it will kill stray weed seeds and pathogens which make their way into the ingredients. Some of the bacteria and fungi at work breaking down compost materials are also at work neutralizing pathogens, but maintaining 140 degrees F provides me with extra peace of mind. Your compost is done when it has cooled to ambient temperature and has this dark color, crumbly texture and an earthy smell. Regardless of your compost temperature, you can opt to throw the weeds in or keep them out – depending on your comfort level. Worst case scenario: You have a few weeds sprout up in your garden beds. That’s a risk I’ll take to benefit from the extra nitrogen the weed material adds to my compost heap. What I won’t risk is adding diseased foliage – which leads us to the next question. 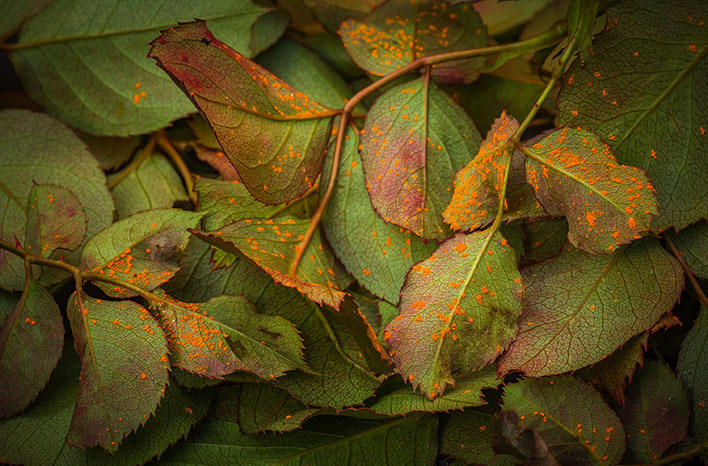 Can diseased plants be added to compost? Whenever I spot diseased foliage on my plants, I prune it off as soon as possible to prevent the disease from spreading. I don’t add that material to my compost. I bag it up, and I remove it from my property. 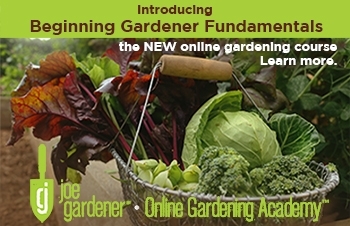 It’s just one more proactive step I can take to manage disease issues in my organic garden. 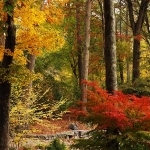 Higher temperatures of 140 degrees F or more are necessary to kill the disease pathogens on or in the foliage. Even if my compost is maintaining at those temperatures, that’s still no guarantee since some diseases require temperatures hotter than a home composting situation can attain. Since I can’t be certain that the conditions within my compost will kill the disease, I play it safe and keep it out. The last thing I want to do is spread disease through my garden when I amend with compost. It’s just not worth that risk. Can I add the manure from my chickens as a source of green material? 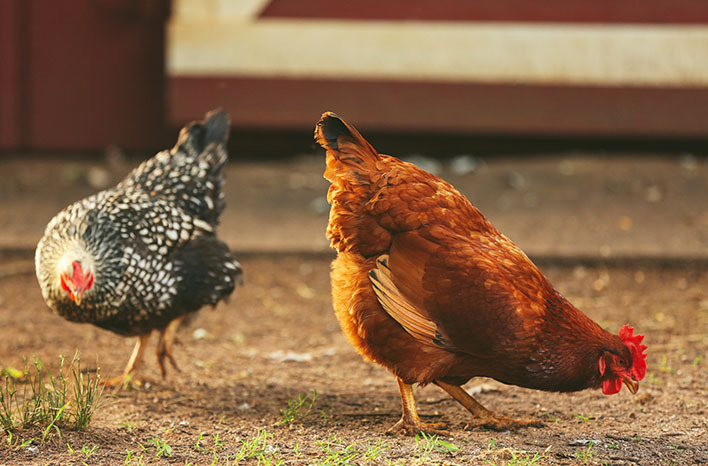 Absolutely – chicken manure is a fantastic nitrogen source in compost. I have chickens at the GardenFarm, and their manure is one of the reasons my compost is so rich. I use wood shavings as chicken bedding, and it’s impossible to separate the manure from the fine shavings. So as I add this to my compost heap, I’m adding both green (manure) and brown (shavings) at the same time. All of these materials are small, so they break down quickly in the pile and, together, really help to bring up the overall temperature. One word of caution: Don’t add chicken manure directly into your garden beds. Its nitrogen level needs to mellow through the composting process. I never put diseased foliage into the compost bin. There is too great a risk that those pathogens won’t be neutralized and will be spread through my garden when I amend with the finished compost. Would leaves and chicken manure make good compost? The thought of using leaves and chicken manure as a compost blend makes me swoon a bit, to be honest. Shredded leaves are one of my favorite materials to add to compost (or use as mulch), and as I’ve already explained, chicken manure can’t be beat. So, the combination of the two would make fantastic compost. Go for it! Can the shavings with chicken manure overload my compost with carbon? The chicken manure, itself, is so high in nitrogen that a little goes a long way. So as a general rule, the high nitrogen of the manure should prevent an overdose of carbon from the shavings. That said, observe the reading on your compost thermometer. If the temperature dips a few days after you’ve added the manure and shavings, it’s possible you do have too much carbon. Add some kitchen scraps, grass clippings or other green materials, and watch to see if the temperature goes back up to the range you are aiming for. Regularly observing the thermometer reading will guide you throughout the compost process. Anytime the temperature cools, think back to the basics. Do your materials seem to be in balance? Have you been turning the pile each week? Is it moist enough – or too moist? You should be able to diagnose the likely cause, make adjustments and watch the temperature to see how the compost is responding. The manure my GardenFarm chickens provide is a potent form of nitrogen and one of the reasons my finished compost is so rich. Can wood chips be used in compost, or will they change the pH? Arborist wood chips – the raw wood chips – are best used as mulch. They won’t affect the pH of soil or compost. 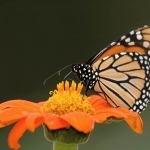 They can certainly be added to the compost pile, but their coarse, woody nature will require a lot more time to biodegrade to finished compost. Although wood chips are an easy way to bulk up your compost heap, the wait before it’s usable as compost isn’t worth it for my active system. I prefer to use wood chips as mulch or in a separate pile to break down on their own – over about two-years. It’s a common myth – I repeat, myth – that raw wood chips when used as mulch will rob nitrogen from the soil. When used as mulch, those chips only come in contact with the surface of the soil. 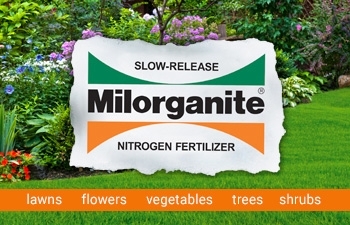 Subsequently, they only impact the nitrogen of the surface – 1/16” of the soil, at most. All the soil beneath the surface is not negatively impacted, because the chips are not in contact with that soil. When raw wood chips are blended into the soil, then all of the soil surrounding the wood is being depleted of nitrogen – because there is direct contact. So, why is it okay to blend raw wood chips into compost if you should avoid blending wood chips in with soil? Although the wood chips are taking nitrogen from surrounding compost materials, you will be adding more nitrogen into the heap every time you add green materials. 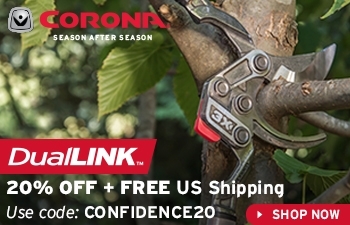 That will keep your compost pile in balance. Raw wood chips are a great material to use in compost or as mulch. Contrary to popular belief, these raw wood chips will not rob nitrogen from my soil. Can pine straw be added to compost? Some gardeners are concerned that pine straw – because it is acidic – will lower the pH of compost. In a compost bin of balanced ingredients, that’s just not a problem. Your compost will balance out close to the ideal pH – around 7.0 or neutral. Pine straw can be a little awkward to work with in compost, and it contains lignin – a chemical which will cause the needles to decompose more slowly than other compost materials. Once your compost has finished, some of that pine straw may remain intact. That’s why it can be a good idea to use a compost sifter. The sifter is an easy and inexpensive DIY project, and you will use it often. When I’m ready to use my compost, I place the sifter over a wheelbarrow and gently work the compost along the sifter. This provides the consistency I love to work with, and any materials which haven’t broken down are caught in the sifter and can be added right back into the compost pile. Is it possible to add too many coffee grounds to compost? I add a lot of coffee grounds to my compost. I collect it from a local coffee shop, so when I say I add a lot, I mean 50# bags at a time. The grounds are a great consistency for compost, and they are a rich source of nitrogen. 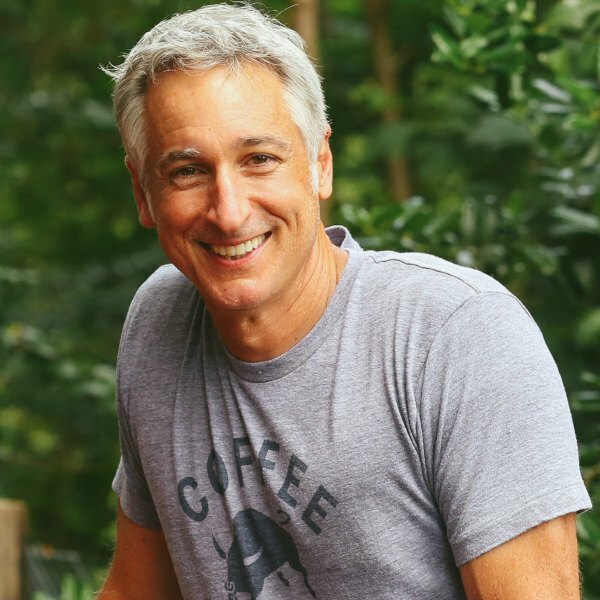 If I notice a slightly sour odor (likely the result of too much nitrogen that is also too wet) after I’ve dumped in my weekly coffee grounds bonanza, I just add more carbon materials – like leaves or paper – to balance things back out. 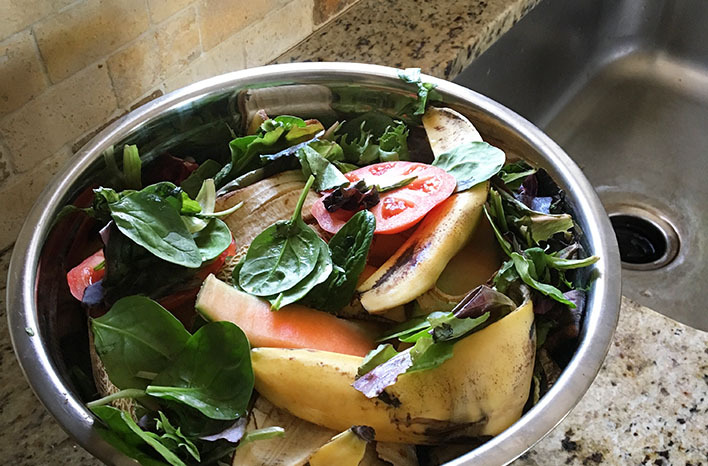 It’s this easy approach to balance that I hope will encourage you in your home composting. Don’t sweat those ratios! Can citrus be added to compost? I often add citrus to my compost, and I have never had a problem. When you consider that citrus is such a proportionately small amount of material in relation to the entire compost pile, it’s easy to see that the overall balance in the heap will offset any negative effects of any single ingredient. Can wood ash be added to compost? Wood ash is one ingredient that I add sparingly – even when I know my compost is balanced. The ash is a good carbon source; and it provides potassium, phosphorus, calcium, boron, and other valuable nutrients. Yet, it is so alkaline that too much can negatively impact the pH of even balanced compost. You can add some – just don’t add much. What to do with the rest of your wood ash? Well, it’s a great lawn amendment. After I’ve added a bit of the ash from my fireplace to my compost, I use a scoop and loosely scatter the rest around my lawn on a calm day. It’s a decent substitute for lime to raise soil pH. How do I keep chickens from kicking my composting materials out of the compost bins? My GardenFarm chickens do like to get into my pallet compost bins. I don’t see this as a problem, although it can be a little messy. Each time I turn the compost, I just scoop any loose materials right back into the heap. If you want to avoid the mess altogether, I recommend you stack a piece of wood or two at the front of the bin to block any material from being kicked out. In the meantime, the chickens are helping to turn your compost materials, and odds are pretty good that they are leaving a few “immediate deposits” into the mix while they are at it. Win-win. Are black fly wasp larvae, pill bugs or other insects in the compost a problem? I’ve referenced a number of times here the organisms at work in your compost pile to break materials down. These bacteria, fungi, nematodes, protozoa, earthworms, beetles, and a host of other microorganisms are all part of the soil food web. The soil food web – with all its cast of characters – is what ultimately feeds your soil and keeps it aerated and healthy. Pill bugs, bug larvae, and ants are all part of that soil food web ecosystem. I consider them to be a friend, rather than a foe, in my compost. When it comes time to use the compost, I know I’m not able to separate the bugs out, but that’s okay. I can manage them in my garden with a little help from the predators who like to feed on those creatures, and the benefit to my compost is worth it. Some gardeners prefer an open compost pile as seen here. I used this system for many years in a corner of my backyard, but I now prefer bin enclosures to keep things tidier. Is composting at home over winter worth it? Compost will continue to break down during cold weather, but the process will slow down significantly. There are different microbes at work during different seasons, and you can learn more on how they are at work in the free Complete Guide to Home Composting. You can continue to add materials throughout the winter, but rather than throw them on top of a snow-covered pile, I recommend you create a covered entry into the heap. One approach would be to tuck a couple of hay bales into the side of your heap and cover the bales with a sheet of plywood. Anytime you need to add compost materials, you can brush the snow off the plywood, lift it up and add the materials to the area between the bales. You certainly don’t need to use hay bales – use your imagination. Your goal is simply to create a protected area in contact with the compost pile. Since the decomposition process has slowed, you don’t need to worry about turning or adding water to the pile. Just let the compost be until the weather begins to warm, and things start to thaw a bit. 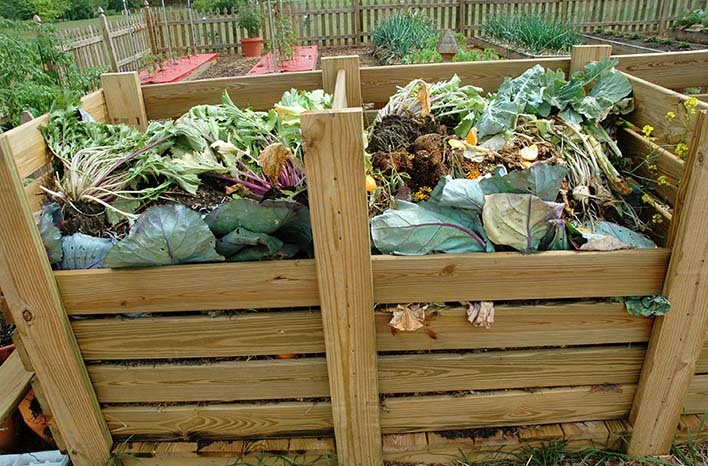 Is it better to use a compost pile or a bin system? I composted in open piles for years, and I’ve worked with just about every closed bin system out there. My favorite method, by far, is my current three-section pallet bin system. It looks nice and keeps the compost tidy. Some gardeners like a closed bin to keep out critters or to prevent neighborhood complaints. Other gardeners prefer working with an open heap. All in all, it’s really just up to personal preference. What are the best dimensions for a compost bin? My bins are 5’ tall and 4’ wide. They are built of pallets, which aren’t always made the same size. I shared a how-to video demonstrating how I put this system together. It’s an easy afternoon project, and since most pallets are available for free, it’s inexpensive too. In the past, I’ve worked with bins that are 4’ wide and high and have found that size works best for me. So when I replace my current bins, I will rebuild at 4’x4’. Ultimately, size is also a personal preference. As long as the bin accommodates a heap that is 4’ square and 4’ high – anything goes. Is it necessary to have more than one section in a bin system? I recommend you have at least two sections or heaps. Why? I used to have just one heap of material, and I kept on adding inputs to that lone heap. Since I kept on adding, the compost was never done. Parts of the compost had broken down, but there were always those new materials in the mix. It’s best to have at least two piles, so as the first pile reaches that ideal 4’x4’x4’ size, you can stop adding materials to that pile and add them to a new pile instead. The first pile will continue to break down into finished compost, as the second pile grows with new inputs. I’ve used just about every method available for composting, but my favorite is a three-bin system contained by free wood pallets. I now use the fourth bin, seen here at the far right, to store plastic pots and miscellaneous garden tools. 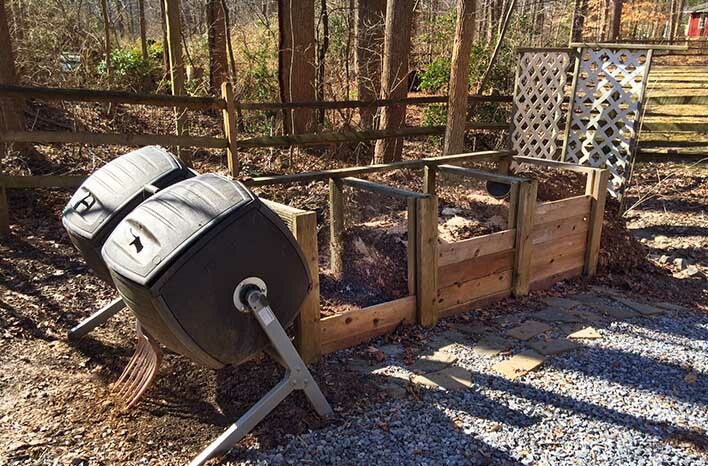 How do you use your three-bin compost system? Just as I recommend having at least two piles, I make so much compost that I have more luck with three piles organized into bins. I add materials to one bin until it’s 4’x4’x4’ – then, I stop adding inputs to that bin and start building a new heap in another bin. While I’m building the second pile, I’m still turning and wetting the first, large pile. Before that first pile has turned into compost, my second pile has usually reached 4’x4’x4’, so I have to start another new pile in a third bin. As the third pile grows from additions of new material, I continue to turn and wet the first two piles. Eventually, the first pile turns into finished compost. By that time, the second pile isn’t finished, but it’s on its way. Meanwhile, the third pile is reaching maximum size. I use the finished compost from the first pile and can, then, use that first bin to start yet another new pile. I always have one heap that is done or nearly done – as well as one new heap and one heap that is breaking down but actively cooking. How can I keep tree roots out of the compost pile? I have trees all around my compost bins, and unfortunately, tree roots always seek out compost. They sense the rich nutrients and creep in to take advantage. I can’t blame them, really, but I can tame them. Invading roots tend to be thin feeder roots which can be hacked off fairly easily with a sharp shovel blade. Each time I cut them back, I know they will inevitably encroach again. Adding a temporary barrier, such as cardboard, won’t prevent roots from creeping in. The cardboard will just break down into the compost anyway. Resign yourself to ongoing maintenance and the continual reminder of the resiliency of nature. 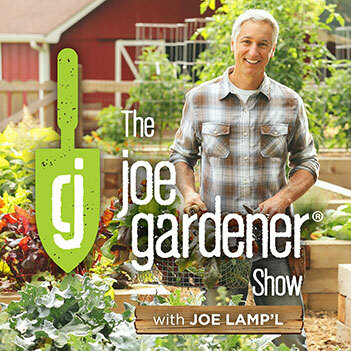 Thanks to my Director of Online Media for joining me in the studio for this podcast to share the joegardener Facebook group questions. 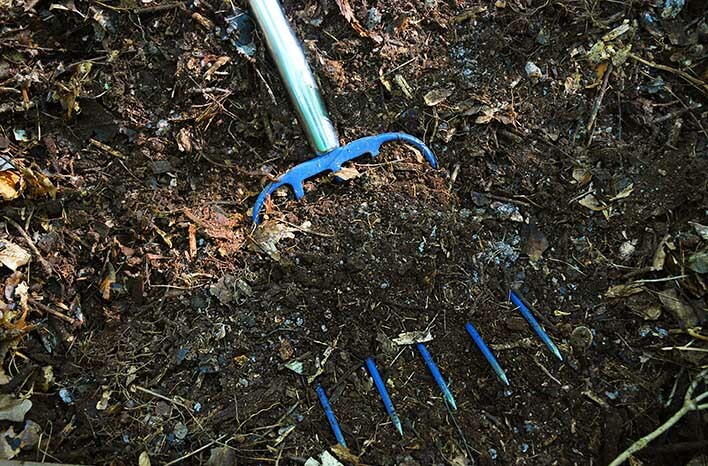 How do you amend with compost when your soil is covered with wood mulch or (another natural mulch)? I want to get the nutrients in compost as close to plant feeder roots as possible. That means getting the compost onto the soil surface. Since I mulch my beds, I pull the mulch away from the soil and, then, add the layer of compost. Okay – I’ll admit that don’t always do that. Pulling back the mulch is certainly more work, and I just don’t always have the time. When things get busy, and I need a shortcut; I add the compost directly over the mulch layer. It’s not ideal, but it gets the job done. 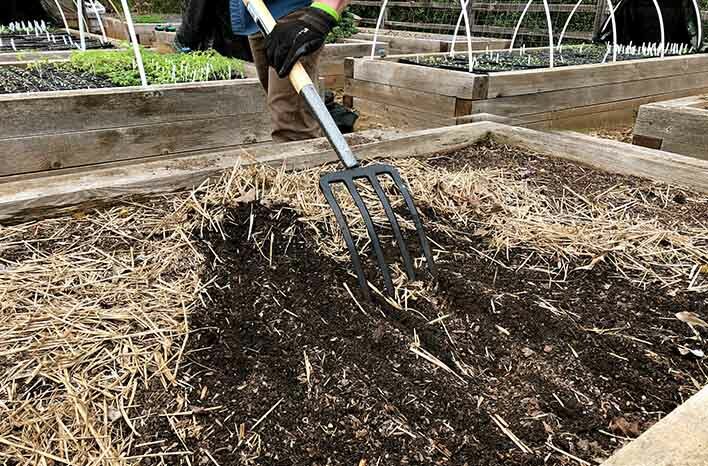 Plus – the layer of compost will help the mulch to break down into the soil more quickly. The bottom line is that there’s nothing wrong with this alternative approach. If you can pull back the mulch – great. If not – don’t sweat it. After I’ve amended, I’ll push the mulch back over the amended soil – or add a fresh layer of mulch. That said – if you plan to sow seeds directly into the soil – be mindful that chunky wood chip mulch can inhibit young seedlings from emerging. It’s best to remove wood chips before you sow those seeds. I typically make a point to pull mulch back away from the soil surface before I amend with a layer of compost. I hope the answers to these questions will be helpful for your home composting. If you haven’t already done so, I recommend you listen in to the podcast by scrolling to the top of this page and clicking the Play icon in the green bar under the page title. 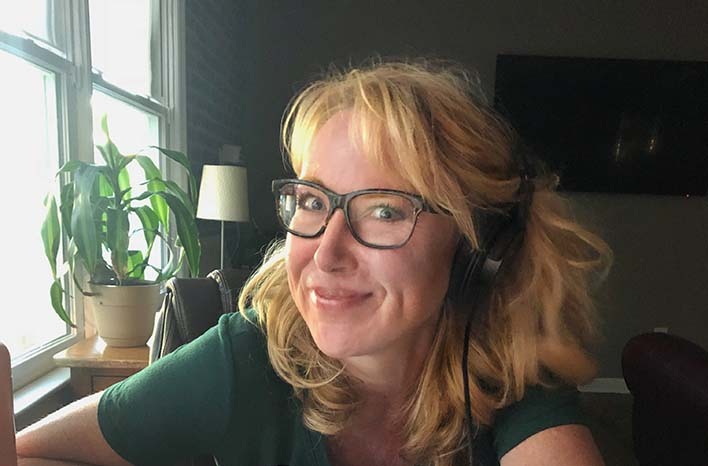 You’ll hear a fun conversation as Erin, my Director of Online Media, posed the questions from the group and joined me in a recording for the first time. We hope you let us know if you liked this format, so we can make plans to do this again. You’ll also hear a cameo from Louie, the largest and most vocal of the roosters in residence at the GardenFarm. What additional questions do you have about composting? Let us know in the Comments section below. 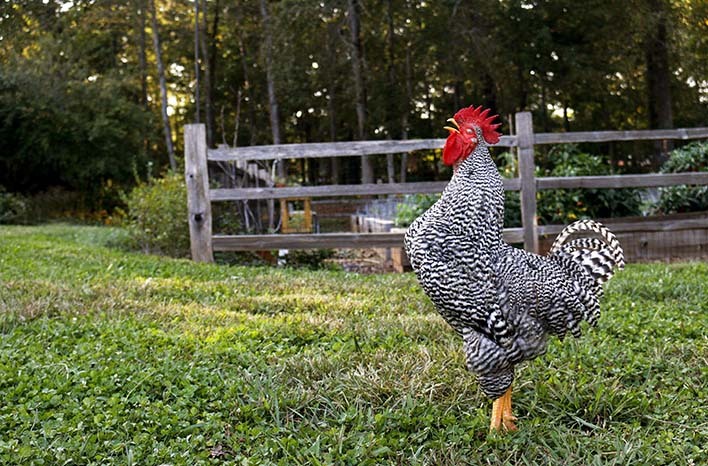 In the podcast recording, Louie – proud rooster in residence at the GardenFarm – chimes in from just outside the studio.